There are multiple images in the threads of most all of the teams at Heathrow, only one in the summary. And well. I am spending about 6 hours a day searching blogs, photo albums, local media, tweets, alerts, and "social media", as are many of the Detectives... how about you?? Any help provided is appreciated!! Wouldn't also be fair to point out that so far, we only have video/caps/i,ages from the boat rides to the start and one image of some of the teams ar Heathrow? Came angles, image quality, lighting, all can affect whay we see in different ways that sometimes the same person looks like two different people. Yhis is where information other than images is useful. such as the social networks and search rsults, right? I have a concern that we're becoming too dependent on tweets, because there are still the possibility that local media (especially in languages other than English), and bloggers will be posting useful data that can help fill in the pictutr. Welcome to RFF doctorj. Was this at Logan? Yes, this was at Logan -- I would have mentioned it earlier, but didn't realize how much digging you guys were willing to do! LOL... to the outer limits of space if needed! Their faces are different to me and the height doesn't look the same either. Of course it could be the angle of the camera but I think you are on to something littlebird. Thanks for pointing it out. I wouldn't read too much into heights being moderately different since any pageant shots were probably done in pretty serious heels and Racing would probably be done in some verision of flat/sneaker/low heel height boots. Good point selkie. I hope we can get more photos! The shape of the 2 faces look different to me though. Is this the Team Pink inside the car? IF SO..... Team Pink is still in the Hong Kong Leg! Yes,look the same green pack of the blonde. Aren't Ag+ the person who took these two photos?He isn't the one who saw at Cheung Chau. OH! And apparently it's Kevin's birthday today! @kevjumba Happy birthday Kevin! Even though you're probably running around with your dad and the filming crews of Amazing Race by now. here is the best backpack photo of blonde team pink that we have...her partner's pack is black. BUT!! do keep in mind that we have no pack picture of Team Turquoise...and while this looks like PINK blonde...I don't want us to rule out Stephanie. It is totally possible that they could be carrying green packs as well...we just don't know. Found one! They have blue/black packs. And anything that is speculation...you know where to take it, okay?? Thanks for posting the pic uycocoa!! BUT!! do keep in mind that we have no pack picture of Team Turquoise...and while this looks like PINK blonde...I don't want us to rule out Stephanie. It is totally possible that they could be carrying green packs as well...we just don't know. The other one in taxi is female,so this should be F/F team I think.People who took the photo told us this is an F/F team.Since we know they have a blonde and carry green pack(lime green team carry black pack), and the blonde look definity not the girl in blue team...I think we can confirm this is pink team. I can't see the other one in the taxi... but have limited viewing just now...can someone post the other person's pic please?? I magnify the picture and pretty sure there is another woman in taxi. And the person who took this photo posted this in "TAR17 Speculation"
I'm the person who took those photos. I saw that 2 teams went intp Seibu Department store in Tsim Sha Tsui for a while. 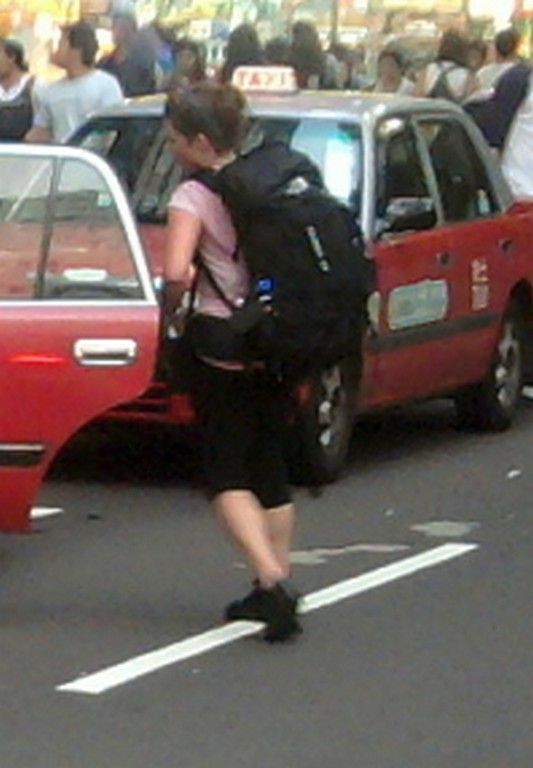 Then two teams ran to the intersection of Nathan Rd and Haiphong Rd. I tried to run and catch them but there were many people on the streets. One of two teams go on a cab and another team of 2 girls call for another cab. However, it seemed that the cab driver didn't understand their English. So the cab stop on the road for around 4 minutes and then go away too. Thank you so much Weihen!! Do we know what the other team was? Guys? A couple? Any description? I just saw them at Tsim Sha Tsui and the photos were taken by me. Oh! I found 2 more photos on my android! Brightness and contrast of the second photo are adjusted for better identification. Well, the new pictures clear up any doubt.... this is the pink team! No doubt at all!! Hair, shoes, and pack all match Pink team Brunette...GO PINKS!! But looks like the pink flower bit the dust somewhere along the way. At first glance, I didn't speculate, I concluded.